Originally published under the title, "Menendez and the Demise of Liberalism." The current controversy over Israeli Prime Minister Benjamin Netanyahu's proposed speech to a Joint Session of Congress obscures a deeper issue about American politicians and U.S. policy toward Iran, namely that they are not lining up conveniently along party lines. It is true that most Republicans in the Congress do not agree with President Obama's approach to negotiations with Iran. I think they are right not do. Yet the President's life is complicated even more by a senator from his own party, Robert Menendez of New Jersey. He too disagrees with Obama's approach to Iran and has done so since Obama became President. From 2013 to last month, he did so as the powerful chairman of the Senate Foreign Relations Committee. Menendez, more than any other political figure in Washington, has prevented the Iran issue from displaying the familiar and convenient divide between Republican "hawks" and Democratic "doves." In numerous speeches on the floor of the Senate and in comments during many hearings of the Committee on Foreign Relations, he has criticized and carefully documented what he views as the steady erosion of the American negotiation position in the talks with Iran. He has led the push for deeper sanctions in the perhaps futile hope that economic pressure would lead the Iranians to turn away from the bomb without the need to resort to force. Sen. Menendez has command of both broad strategic issues and technical details of the negotiations. The senator has done so with tact, deep knowledge of the subject and by holding numerous congressional hearings on the subject. In the process, he has earned the respect of senators in both parties because he is formidably well informed and has command of the broad strategic issues as well as the daunting technical details of the negotiations. It is precisely because the President cannot dismiss him as a member of the political opposition that he has been a thorn in the side of the Administration. Yet Menendez has been swimming against the main current of liberalism in the Obama era, one that finds little or no room for the traditions of liberal anti-fascism that were once one of American liberalism's defining features. Menendez' has proposed support for legislation in Congress to impose new sanctions if the Iranians insist on terms that he believes will allow them to move towards the bomb. At a meeting between the President and Democratic senators several weeks ago, that legislative proposal drew the President's ire. He told Menendez and other Democratic senators that new sanctions would lead the Iranians to leave the negotiations and undermine the administration's effort to arrive at a deal. According to a report in the New York Times, the President added that "such a provocative action could lead international observers to blame the Americans, rather than the Iranians, if the talks collapsed before the June 30 deadline." Democrats in Obama era find little room for the tradition of anti-fascism that was once a defining feature of American liberalism. People, of course, can differ about what impact stiffer sanctions would have on the Iranians. But the President went further. According to the Times, with Menendez's proposals for stiffer sanctions in mind, he said that "he understood the pressures that senators face from donors and others, but he urged the lawmakers to take the long view rather than make a move for short-term political gain." In other words, the President told Menendez in front of a gathering of the other Democratic senators, that the senator had taken his positions on Iran because "donors and others" had pressured him to do so. In a room filled with experienced politicians, the President, in effect, said that the senator had been bought by unnamed persons and groups. The President did not refer to the "Israel lobby" but Menendez understood what the President was implying. The Times report continues as follows: "Mr. Menendez, who was seated at a table in front of the podium, stood up and said he took 'personal offense.' Mr. Menendez told the President that he had worked for more than 20 years to curb Iran's nuclear ambitions and had always been focused on the long-term implications." President Obama called into question the integrity of a former chairman of the Senate Foreign Relations Committee and now its ranking Democratic member. Imagine the scene of Menendez standing up to say to the President's face that he took "personal offense" at what he had just said. Menendez knew very well that Barack Obama had just questioned his integrity in front of his colleagues. He was having none of it. The Times quoted one of Menendez' unnamed senatorial colleagues as saying that "it was a forceful exchange between two strong personalities. It was not an angry exchange. It was clear, forceful, vigorous." Yet the chances are good that Robert Menendez was indeed quite angry when he rose to tell the President of the United States that he took personal offense at his suggestion that money, not conviction and judgment, were responsible for his views on Iran. All hundred senators are likely now aware that the President called into question the integrity of one of their colleagues, the former chairman of the Senate Foreign Relations Committee and now its ranking Democratic member. 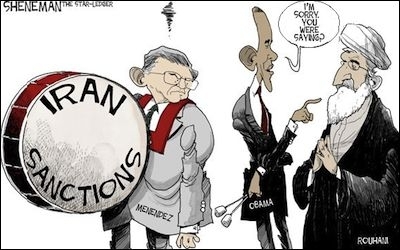 To repeat, the problem that Senator Menendez poses for President Obama and for many of his fellow Democrats is that he makes it more difficult for the President and liberals generally to make the Iran issue divide along the conventional left-right divide. It is the same problem currently being posed by the editorial page of the Washington Post, and by the New Republic when it was owned by Martin Peretz. It was the problem posed for liberal intellectuals and journalists when Elie Wiesel raised his voice to warn about the Iranian bomb and when Paul Berman published Terror and Liberalism in 2003 and connected the writings of Sayyid Qutb to the perpetrators of the 9/11 attacks. As I pointed out in this blog several weeks ago, it is the same problem that was created by the Euston Manifesto and by the American Liberalism and the Euston Manifesto statement. In 2006 both urged liberals to focus on the threats of Islamism, the new anti-Semitism and the Iranian nuclear threat. As the realists in the Iraq Study Group were calling for engaging Iran, these various voices urged liberals to focus on the enormous danger a nuclear Iran posed to the world. The truth is that these efforts to revive the traditions of liberal anti-fascism applied to Islamist movements and to the Iranian regime have remained marginal in liberal politics in the United States. They remain a minority within the Democratic Party and have not set the tone and substance of policy in the Obama White House. The ascendency of Barack Obama to the Presidency was about opposing the Iraq war, not about discussing affinities between the ideology of the Iranian regime and the radical anti-Semitism of Europe's 20th century. Those who call themselves liberals have been unable or unwilling to recognize the affinities between Islamism and deeply reactionary forms of totalitarianism. The now absurd refusal by the Obama administration to connect Islamism as an ideology to the practice of the Islamic state or recently to acknowledge that the murder of Jews is Paris is due to anti-Semitism is part of the irony of the above-mentioned liberal silences since 9/11. Those who call themselves liberals have been unable or unwilling to name and recognize the affinities between Islamism in its Sunni and Shia variations and deeply reactionary forms of totalitarianism of the twentieth century. Liberalism, which was historically the home of anti-fascism, has, in its predominant currents, ceded that position to centrists and conservatives. This is the deeper historical significance of Barack Obama's comment about donors' influence on Robert Menendez. Both Netanyahu and Menendez are right in their implicit assertion that the question of whether or not Iran should get the bomb is not an issue of liberalism or conservatism but one of whether we are going to take the Iranian's intentions seriously or fool ourselves with illusions. In history, events rarely arrive at times that are convenient for everyone's calendar. If, as may be the case, the United States is about to sign a deal that the Israeli prime minister thinks is a dangerous one, he should use every forum he can find to speak against it. Those Democrats who are unhappy about his proposed speech should be asked how they propose to stop Iran from acquiring nuclear weapons and what answers they have to the many good and critical questions that Netanyahu, Menendez and many others have posed about the Administration's approach to the Iran negotiations. Rather than focus their anger on the leader of Israel, a small country that is threatened with destruction should Iran get the bomb, they could spend their time more productively by reading or rereading the speeches and comments of Senator Menendez as well as the text of the many hearings he held in recent years by the Senate Foreign Relations Committee about American policy towards the Iranian nuclear issue.